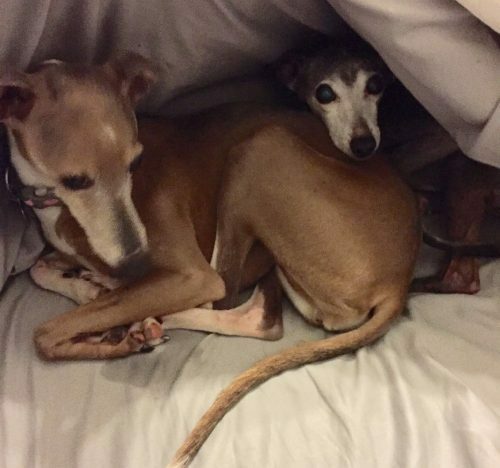 Baylee and Toby have been together since Toby was 8 weeks old and you can tell. They love to play with each other and even take turns eating food out of the same bowl. When you see one of them, the other is close by, if not right beside them. They would very much appreciate it if they could stay together. Their previous family had to move and weren’t able to take them along but it is obvious these babies were well taken care of and taught basic “manners” (sit, shake, kennel up, go potty - and their favorite - come here!) They love to be right next to you, or on your lap, under a blanket; however, they are perfectly content sleeping on their bed curled up together. They are not afraid to show and receive affection in a variety of ways like direct eye contact, subtle reminders to keep petting (nose nudge), scooting closer to you, excitedly wagging tails when you get home and let them out of the crate, etc. Baylee is Toby’s older sister. They are not from the same litter but have been together since he was 8 weeks old. 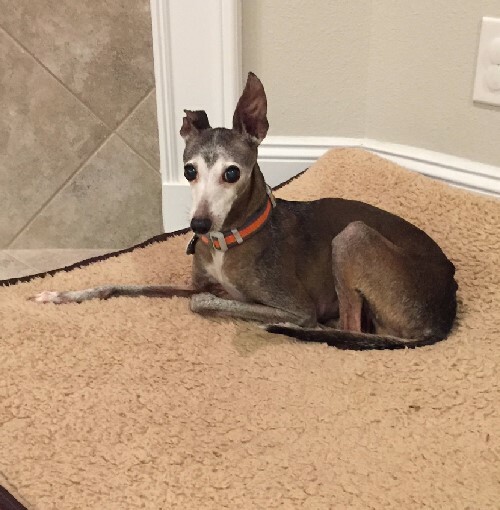 Baylee is a beautiful fawn and white “Biggy Iggy”, weighing in at 19 pounds, and is 11 years young (seriously, you wouldn’t know she is 11). She is a bit wary when she is in a new situation but will warm up once she becomes more comfortable. She relies on Toby and is never far from his side. If Toby is comfortable, then she is as well. Baylee is crate trained and will get in when told to. She will let you know when she needs to go to the restroom. She needs a nice size backyard with a tall fence. She loves to chase and retrieve the tennis ball, and with all that muscle, is capable of jumping really high. She loves to go on walks, and if she hears the word walk, she gets really excited. She tends to pull on the leash during the first part of the walk, but gets better as the walk progresses. She is wary of other dogs and will bark. 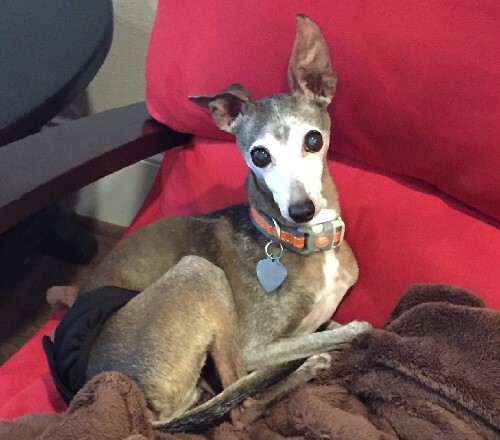 Baylee has a bald spot the length of her spine and had quite a few teeth removed, but she has a clean bill of health. She is very tolerant of young children (we have a very active 4 year old) and will let them hug on her. She loves to curl up next to Toby, or a lap. He favorite spot is under the blanket next to Toby. Baylee relies on Toby for comfort. She is nervous when he is not around. Toby is Baylee’s younger brother. He is a small guy at only 10 pounds, but he has a giant size personality. He is 9 years old. He is very outgoing, adventurous and is not a nervous Iggy (except when he can’t find Baylee). Toby is crate trained and will get in when told to. He gives subtle signs when he needs to go potty, so he may need a belly band in case those signs are missed. Toby’s favorite thing is playing with Baylee. He will chase Baylee and wrestle around with her. He loves to go on walks and gets excited when he hears the word walk. He does very well on the leash and walks right next to you. He is wary of other dogs and will bark. Toby had a few teeth removed but is very healthy. He is tolerant of young children but does not like to be pulled on. He loves to curl up on a lap or next to Baylee. His favorite spot is under the blanket next to Baylee. 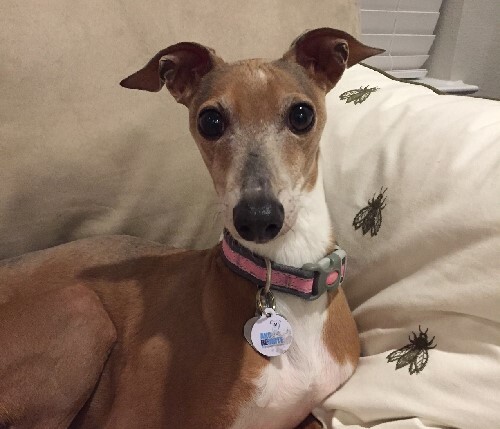 Toby is very connected to Baylee and will let you know if he can’t find her. 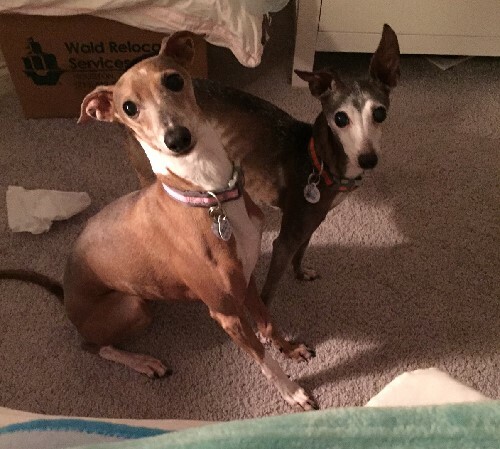 Baylee and Toby’s previous owners had to move and weren’t able to take them along; however, it is obvious these babies were well taken care of and taught basic “manners”. Sit, shake, get the ball, kennel up, go potty…and their favorite, come here! They love to be right next to you, if not on your lap, under a blanket; however, they are perfectly content sleeping on their bed curled up together. They are not afraid to show and receive affection in a variety of ways– take the direct eye contact, subtle reminders to keep petting (nose nudge), scooting closer to you, etc. 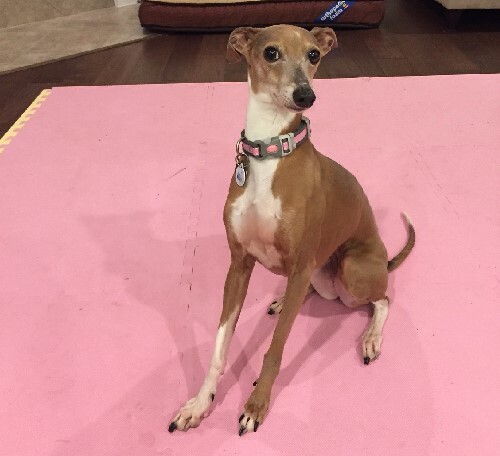 Baylee is the beautiful fawn and white biggy iggy weighing in around 16 pounds. This is all muscle. You would never even guess that she is 11 for she truly is amazing to watch when she runs. The fact that she is missing a patch of fur along her back does not take away from her extremely clean bill of health. She had to have 18 teeth extracted but it doesn’t stop her from eating and accepting the occasional treat. She loves to sleep under a blanket (next to Toby) right next to you or on the dog bed. She is working on her manners while on a leash. She gets a bit excited when new people or animals are near. Toby is the tiny grey dude with the white mask. He is all of 9 pounds but he thinks he’s a Great Dane! Very friendly and outgoing, very dependent on Baylee though, and always wants to have her close by. He is 9 years old and is mature for his age. We really want to rename him “prancer” because that is how he walks/jogs. He simply prances! Although Baylee is older and twice his size, he is the “alpha” in their pack. He loves to burrow under the blankets and be right by your side. Both of these babies have the best personalities and are extremely tolerant of our 4 year old (who loves to love on them). They are well mannered, though they are counter surfers and beg while you are eating (we are working on those manners), generally easy going and friendly, and for the most part, potty trained. You have to keep an eye out for the very subtle hints from Toby or he’ll mark his spot. We have found that using a belly band is the solution for that!